Speaking in Moscw after a visit with his Russian counterpart, Syrian FM Walid al-Muallem declared the Syrian military to be ready to “go all the way” in an offensive against rebel held Idlib, saying that the goal is to wipe out terrorist groups that persist in the deescalation zone in the area. Idlib and the surrounding area is the last major rebel-held territory in Syria, and Muallem indicated that the presence of a large al-Qaeda affiliate in the region is viewed as a particular problem. Clearly, the Syrian government wants to reclaim the entire region, but Muallem indicated that ensuring al-Qaeda can’t just operate out of the deescalation zone is of particular importance. Tens of thousands of rebels from different factions are operating in Idlib and neighboring Aleppo. The forces are mostly centered on a pair of coalitions, one led by al-Qaeda and the other dominated by the Turkish government’s proxy forces. Officials familiar with it say that Syria has been gearing up for the offensive for some time, and Russia is expected to provide air support. Exactly when the offensive will begin is unclear, however, and there are calls to delay out of humanitarian concerns. Don’t wait till White Helmets stage another chemical attack. Exactly … White Helmets are just another CIA terrorist front group. We could stop a whole lot of terrorism if the CIA was disbanded. Then, without being shielded as a Government Organization, the former members could be arrested and tried as the criminals they are. “Humanitarian concerns”? Funny. That doesn’t seem to stop the Saudis from bombing school kids and buses. Well the humanitarian concerns look like they are on the part of the Syrian government. Saudis have made clear they couldn’t care less. 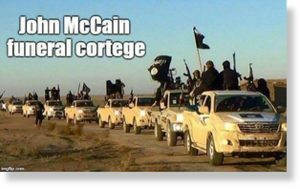 The Syria takfiris have lost a major supporter with McCain’s death. Tactical nuke. What chlorine? what white helmets. When Assad was doing badly in this war, the first big advice he got from Russia was to break up the war and the opposition into manageable pieces, and then defeat them one at a time with overwhelming force. That is exactly what he did, and it worked. It was possible because the terrorists were so fragmented among themselves and their vast numbers of sponsors. It is ending now as it was won, as Assad gets around to taking down the last piece. This was always the plan. It has been years in the making, steady and consistent. The strategies promoted by Russia and carried out by the Syria Arab Army, with support from allies, have been masterful. That includes transporting insurgents out of cities in order to reduce civilian casualties, just the opposite of the destruction and death that the US has exacted upon Iraq and Syria civilians. It would be wise for Assad to hold back on Idlib. Trying to kill 10,000 Al Nusra, mercenaries and Turkmen tribes is going to create a ton of collateral damage in civilian areas. I understand that allowing these groups to stay is not working toward the goal of a complete Syrian restoration, however, they can be contained, a deal made and stability restored. This would be preferable to a situation where Assad can be described as a killer of civilians, possibly in the many thousands.. and the fog of war providing that opportunity needed to sow enough confusion for the US to go to war against Assad for real. Assad also cannot risk infuriating Erdogan over the Turkish presence, including their ethnic affiliated tribes. Restraint and diplomacy is absolutely necessary or we could see an escalation that will be extremely regrettable. It would be indeed tactically wise to surround and infiltrate the area first, while creating humanitarian corridors for all civilians to leave. Once that’s been achieved and the remaining terrorists have been terrified into surrender mode, a politically and morally defensible attack would be possible. he needs to get in and destroy any chemical weapons CiA brought in for the false flag. If they get an inch they will poison a lot of people. One should assume it would be impossible to do this with certainty, there’s just too many nooks and crannies these weapons could be hidden in preparation. What might work is to cover the area with intensive satellite and drone camera monitoring, mine the area with a network of chemical attack monitoring stations, so that if a chemical attack does occur, conclusive video evidence could be produced of where it came from. Of course, evidence is not required in these cases, the ‘coalition’ just ignores them. Far simpler is for the Russians to clarify that any coalition attack on the SAA during the idlib offensive, regardless of whether a chemical attack has occurred, will see immediate retaliation on the attack sources by Russian naval forces in the Mediterranean. I suspect that, in Idlib, any civilian with sense would have known by now that the busloads of takfiris arriving in their area from various parts of the country and taking over some of their homes by force would eventually become targets of a heavy attack. If they did decide to stay they would be in the same category as a person not evacuating for a wildfire or a hurricane. There is no other choice for the government now but to kill every takfiri with maximum force. War is hell.